Figma GridKnight Release Info and Soft Vinyl Anti Teased! 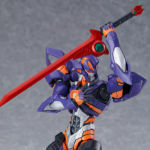 Finally, after months of teasing our friends at Max Factory is gearing up to release Figma Grid Knight from Studio Trigger’s hit SSSS.Gridman anime with a slew of new stock images released in addition to production info. Figma GridKnight will release in September of 2019, retailing for 6,800 yen. To keep up with the theme, Goodsmile revealed a teaser image for the next Soft Vinyl after Ghoulgilas; and it’ll be none other than Anti’s Kaiju form! At the moment, there’s no word on when Goodsmile plans on releasing Kaiju Anti, but we’ll be sure to update you once that info becomes available.